We were successful in our Awards for All bid and with the award we bought a digital projector, computer and sound equipment. We took a show to three venues in the borough during spring 2007; St George’s Church Hall, Chadderton, the Radclyffe School and Uppermill Museum. The Museum gave us hanging space for an exhibition of framed prints, some of which found buyers by the end of the exhibition. We managed to attract a couple of new members but not as many as we had hoped. Funded by a grant from the National Lottery Awards for All scheme, the Oldham Photographic Society will present their Audio Visual programme “Photography Today” at three venues in the Oldham area during February and March 2007. Tuesday 13th March 2007 at 7.30pm Radclyffe Upper School, Hunt Lane, Chadderton. 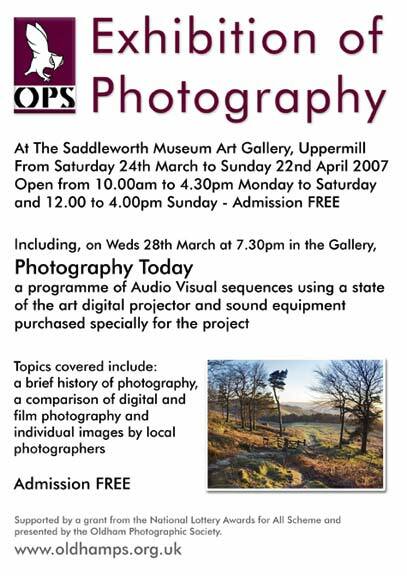 Wednesday 28th March 2007 at 7.30pm Saddleworth Museum Art Gallery, Uppermill. This last event is concurrent with Oldham Photographic Society’s Annual Exhibition which is on at the Gallery from Saturday 24th March to 22nd April 2007. The show will consist of a series of Audio Visual presentations, using a state of the art digital projector and sound equipment purchased specially for the project. Topics covered include: a brief history of photography, a comparison of digital and film photography and subjects of more general interest; Venice, 1940’s re-enactment at the Severn Valley Railway, and a short AV showing a variety of individual images from members in the past year. There will also be an exhibition of members’ prints in colour and black and white.In the last decade, the medium of digital photography has advanced at a phenomenal rate, to the extent that conventional print and slide work has rapidly declined in popularity. To the newcomer to the medium, the array of equipment, both computer and camera, is daunting.It is hoped that Oldham Photographic Society’s presentation will help smooth the transition into digital photography for any enthusiast hoping to make a start.With contributions from a large number of the members, the presentation will demonstrate high quality work which can be achieved with only modest financial outlay and technical ability.Society members will be on hand at the end of the presentation to answer questions. In September the move to the Blue Club in Chadderton was complete. We had been happy enough at the school, although facilities had deteriorated as the building was being replaced by the new school that was to be opened on the site in February 2008. Moving into the new school was not a viable proposition. We could no longer depend on the goodwill of the Headmaster and his Estates staff, as the new school would belong to a private contractor and we were told that a realistic rental charge would be put in place. Figures like £40-60 per week were bandied about and we decided not to wait to find out, so we started to look for a new home during the summer! So, having decided that we wanted to stay in Chadderton if possible, a hunt was begun for premises that would take us at a reasonable rent i.e. one that we could afford! and the Blue Club (North Chadderton Conservative Club) came out on top. In fact, we moved there in time for the start of the new season, in September 2007 and so far we have been very happy there….facilities are great – a big comfortable room, with kitchen and toilets adjacent and friendly staff. The bar is an added attraction for many members as we can have a drink during or after the meeting, which is a great improvement and prices suit our pocket, enabling us to keep subscriptions to an affordable level. Late on in 2007 a brew club was established….simple…if you want coffee of tea, just pop into the kitchen at half time and brew one….seems to work!